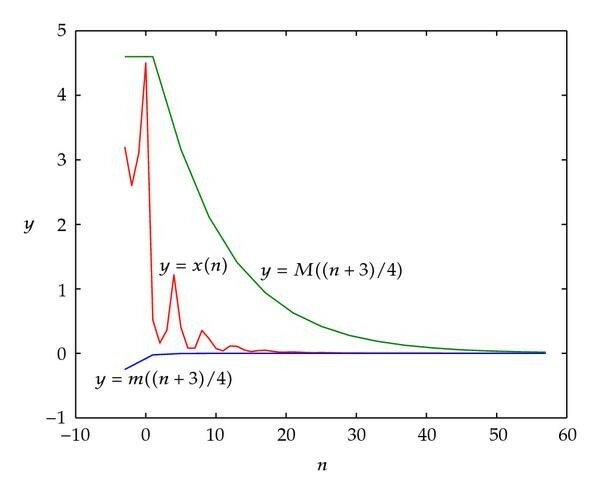 We study the asymptotic behavior of the solutions for the following nonlinear difference equation where the initial conditions are arbitrary nonnegative real numbers, are nonnegative integers, , and are positive constants. Moreover, some numerical simulations to the equation are given to illustrate our results. where the initial conditions are arbitrary nonnegative real numbers, , are nonnegative integers, and , are positive constants. Moreover, some numerical simulations to the equation are given to illustrate our results. This paper is arranged as follows. In Section 2, we give some definitions and preliminary results. The main results and their proofs are given in Section 3. Finally, some numerical simulations are given to illustrate our theoretical analysis. To prove the main results in this paper we first give some definitions and preliminary results [10, 11] which are basically used throughout this paper. has a unique solution . That is, for is a solution of (2.2), or equivalently, is a fixed point of . Let be two nonnegative integers such that . Splitting into , where denotes a vector with -components of , we say that the function possesses a mixed monotone property in subsets of if is monotone nondecreasing in each component of and is monotone nonincreasing in each component of for . In particular, if , then it is said to be monotone nondecreasing in . Let be an equilibrium point of (2.2). (ii) is a local attractor if there exists such that holds for any initial conditions with . (iii) is locally asymptotically stable if it is stable and is a local attractor. (iv) is a global attractor if holds for any initial conditions , . 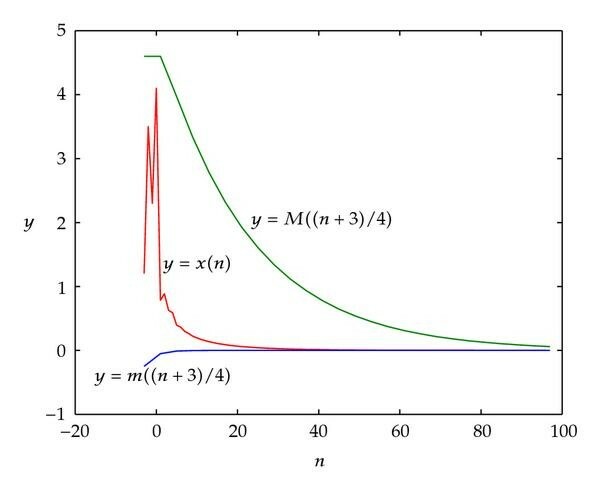 (v) is globally asymptotically stable if it is stable and is a global attractor. (vi) is unstable if it is not locally stable. In this section we investigate the globally asymptotic stability of the equilibrium point of (1.4). If and , then the equilibrium point of (1.4) is locally stable. Moreover, if , then (2.2) has a unique equilibrium point and every solution of (2.2) converges to . Moreover, if , then , and then the proof is complete. then the equilibrium point of (1.4) is global attractor when . It follows by Theorem 3.2 that the equilibrium point of (1.4) is global attractor. The proof is therefore complete. Let . It is obvious that (4.1) and (4.2) satisfy the conditions of Theorem 3.3 when the initial conditions are . Chart of (4. 1) with . Chart of (4. 2) with . The authors are grateful to the referees for their comments. This work is supported by the Science and Technology Project of Chongqing Municipal Education Commission (Grant no. KJ 080511) of China, Natural Science Foundation Project of CQ CSTC (Grant no. 2008BB 7415) of China, the NSFC (Grant no.10471009), and the BSFC (Grant no. 1052001) of China.